Events from the year 1702 in Canada. The Apalachee massacre was a series of raids by English colonists from the Province of Carolina and their Indian allies against a largely peaceful population of Apalachee Indians in northern Spanish Florida that took place in 1704, during Queen Anne's War. Against limited Spanish and Indian resistance, a network of missions was destroyed; most of the population either was killed or captured, fled to larger Spanish and French outposts, or voluntarily joined the English. The only major event of former Carolina Governor James Moore's expedition was the Battle of Ayubale, which marked the only large-scale resistance to the English raids. Significant numbers of the Apalachee, unhappy with the conditions they lived in under the Spanish, simply abandoned their towns and joined Moore's expedition. They were resettled near the Savannah and Ocmulgee Rivers, where conditions were only slightly better. Moore's raiding expedition was preceded and followed by other raiding activity that was principally conducted by English-allied Creeks. The cumulative effect of these raids, conducted between 1702 and 1709, was to depopulate Spanish Florida beyond the immediate confines of Saint Augustine and Pensacola. The Battle of Bloody Creek was fought on 10/21 June 1711 during Queen Anne's War. An Abenaki militia successfully ambushed British and New England soldiers at a place that became known as Bloody Creek after the battles fought there. The creek empties into the Annapolis River at present day Carleton Corner, Nova Scotia, and was also the location of a battle in 1757. The battle was part of an orchestrated attempt by the leaders of New France to weaken the British hold on Annapolis Royal. The British had only captured the fort the previous year and they only had a very tenuous control of the area. The battle, in which the entire British force was captured or killed, emboldened the French and their native allies to blockade Annapolis Royal. Without heavy weapons, the force was unable to effectively attack the fort, and abandoned the siege when British reinforcements arrived by sea. The Battle of Flint River was a failed attack by Spanish and Apalachee Indian forces against Creek Indians in October 1702 in what is now the state of Georgia. The battle was a major element in ongoing frontier hostilities between English traders from the Province of Carolina and Spanish Florida, and it was a prelude to more organized military actions of Queen Anne's War. The Creeks, assisted by a small number of Englishmen led by trader Anthony Dodsworth, ambushed the invaders on the banks of the Flint River. More than half of the Spanish-Indian force was killed or captured. Both English and Spanish authorities reacted to the battle by accelerating preparations that culminated in the Siege of St. Augustine in November 1702. The Battle of Fort Albany (about 26 June 1709) was an attack by French colonial volunteers and their native allies against the Canadian Hudson's Bay Company outpost of Fort Albany in the southern reaches of Hudson Bay. About 70 Frenchmen and 30 Indians attacked the fort, which was under the command of John Fullartine. Fullartine repulsed the attack, killing eighteen men including the leaders. He lost two men to ambush on their way back to the fort shortly after the attack. The Battle of St. John's was the French capture of St. John's, the capital of the British Colony of Newfoundland, on 1 January 1709 [O.S. 21 December 1708], during Queen Anne's War. A mixed and motley force of 164 men led by Joseph de Monbeton de Brouillan de Saint-Ovide, king's lieutenant to Philippe Pastour de Costebelle, the French governor of Plaisance, quickly overwhelmed the British garrison at St. John's, and took about 500 prisoners. Costebelle, whose resources were too limited to hold St. John's, destroyed its fortifications and abandoned it in April 1709. It was later reoccupied by the British. French colonial outposts in Newfoundland were abandoned after France ceded control of the island to Britain in the 1713 Treaty of Utrecht; most of the French settlers were relocated to Île-Royale, now known as Cape Breton Island. Benjamin Church (c. 1639 – January 17, 1718) was an English colonist in North America. He was a military leader of the historic predecessor of the United States Army Rangers, captain of the first Ranger force in America (1676). Church was commissioned by Josiah Winslow, the Governor of the Plymouth Colony, to form the first ranger company for King Philip's War. He later commanded the company to raid Acadia during King William's and Queen Anne's wars in the early 1700s, as French and English hostilities played out in North America. The two powers were competing for control in colonial territories. He was promoted to major and ended his service at the rank of colonel, as noted on his gravestone. Church designed his forces to emulate Indian practices of warfare. Toward this end, he worked to adopt Indian techniques of small, flexible forces that used the woods and ground for cover, rather than mounting frontal attacks in military formation. English colonists developed as rangers under the tutelage of their Native American allies. (Until the end of the colonial period, rangers depended on Indians as both allies and teachers. )Church developed a special full-time unit that combined European colonists, selected for their frontier skills, with friendly Indians in order to carry out offensive strikes against hostile Indians and French in difficult terrain. He used such rangers as militia where the normal practices of having troops march and attack in formation were ineffective. His memoirs, Entertaining Passages relating to Philip's War, were published in 1716 and are considered to constitute the first American military manual. Daniel d'Auger de Subercase (February 12, 1661 – November 20, 1732) naval officer and French governor of Newfoundland and later Acadia, born Orthez, Béarn died Cannes-Écluse, Île-de-France. Subercase was baptised a Protestant to Jean Dauger, a rich merchant and bourgeois who had purchased several noble estates, including the lay abbey of Subercase, near Asson. Subercase served about 10 years in the land forces and in 1684 was a captain in the Régiment de Bretagne before he joined the navy and sailed for Quebec. No sooner had he landed in 1687 than he set off with his contingent on a campaign against the Senecas. In 1693 he was named lieutenant-commander, garrison adjutant and adjutant general. On 1 April 1702 he succeeded Monic as governor of Plaisance, arriving at his post in 1703 during the early years of Queen Anne's War. He immediately attacked Ferryland where he learned from prisoners of a planned English attack on Plaisance with a fleet of thirty-three sail from St. John's under the command of Admiral John Graydon. He immediately set the town's defenses in order and discouraged the attack with the help of two French warships. During the fall of 1704 he organized a series of attacks against English outposts on Newfoundland. With a party of one hundred reinforcements from Canada and three hundred and fifty of his own men, this campaign resulted in the temporary capture of Bay Bulls and Petty Harbour in January 1705 and a failed siege of the main English settlement at St. John's. Unable to subdue the fort they set out to destroying settlements in Conception Bay and Trinity Bay and succeeded in destroying every colony, with the exception of Carbonear Island. The expedition took 1,200 prisoners, and boasted the destruction of 40 cannon, 2,000 shallops, and pillaged 2,600 livres in cash. Subercase estimated that, although St. John's remained intact, the total losses inflicted on the enemy was 4 million livres. Subercase made full use of the following lull in aggression to rebuild the fortifications at Plaisance, improve morale, and generally improve the living conditions of the residents. In 1705 he was made a knight of the order of Saint-Louis and became the governor of Acadia in April 1706. He successfully led the outnumbered defense of Port Royal against two failed sieges in 1707, leading several sallies himself and having his own horse killed below him in one skirmish. The governor of Boston was not prepared to accept defeat and on 5 Oct 1710 General Francis Nicholson’s fleet appeared before Port-Royal and began the Siege of Port Royal. The fleet comprised a landing force of 2,000 men (3,400 according to Subercase), made up of one regiment of English regulars and four regiments of militiamen raised by Massachusetts, Connecticut, Rhode Island, and New Hampshire, and carried in 36 vessels, seven of which were warships. Subercase had fewer than 300 men to set against them. After a few days of defense, Subercase surrendered the partially ruined and under provisioned Port-Royal to the British, expressing to the English commander his hope of returning to pay him a visit the following spring. Subercase, accused of negligence by some officers and reprimanded by New France governor Vaudreuil, was summoned before a court martial at Rochefort, but rapidly acquitted. In 1711 he was offered to be sent to serve at Quebec under Vaudreuil where he could formulate a plan to retake Port Royal while continuing to be paid his salary as governor of Acadia. Subercase refused in disgust and two years later the Treaty of Utrecht was signed ending aggression between the French and English and ceding Acadia and Newfoundland to England for good, thus making Subercase the last governor of French Acadia. Subercase retired and returned to France to live on his estates in Béarn. He continued to draw a captain’s pension of 600 livres a year until he died on 20 Nov 1732 at Cannes. A ledger-stone marks his grave in the church of this village. Lieutenant-General Sir Francis Nicholson (12 November 1655 – March 16, 1728 [O.S. March 5, 1727]) was a British Army general and colonial official who served as the Governor of South Carolina from 1721 to 1725. He previously was the Governor of Nova Scotia from 1712 to 1715, the Governor of Virginia from 1698 to 1705, the Governor of Maryland from 1694 to 1698, the Lieutenant Governor of Virginia from 1690 to 1692, and the Lieutenant Governor of the Dominion of New England from 1688 to 1689. Nicholson's military service included time in Africa and Europe, after which he was sent to North America as leader of the troops supporting Governor, Sir Edmund Andros in the Dominion of New England. There he distinguished himself, and was appointed lieutenant governor of the Dominion in 1688. After news of the Glorious Revolution and the overthrow of King James II reached the colonies in 1689, Andros was himself overthrown in the Boston Revolt. 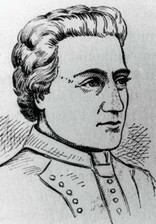 Nicholson himself was soon caught up in the civil unrest from Leisler's Rebellion in New York Town, and afterwards fled to England. Nicholson next served as lieutenant governor or governor of the colonial Provinces of Virginia and Maryland. He supported the founding of the College of William and Mary, at Williamsburg, Virginia, and quarreled with Andros after Andros was selected over him as Governor of Virginia. In 1709, he became involved in colonial military actions during Queen Anne's War (1702-1713, War of the Spanish Succession in Europe), leading an aborted expedition against the French in New France (modern Canada). He then led the expedition that successfully captured Port Royal, Acadia (Nova Scotia) on 2 October 1710. Afterward he served as governor of Nova Scotia and Placentia, and was the first royal governor of the colonial Province of South Carolina following a rebellion against its proprietors. He rose to the rank of Lieutenant-General, and died a bachelor in London, England, in 1728. Nicholson supported public education in the colonies, and was a member of both the Society for the Propagation of the Gospel in Foreign Parts and the Royal Society. He also influenced American architecture, being responsible for the planned layout and design of colonial/provincial capitals of Annapolis, Maryland and Williamsburg, Virginia. He was one of the earliest advocates of colonial union, principally for reasons of defense against common enemies. Rear-Admiral Sir Hovenden Walker (1656 or 1666 – 1725 or 1728) was a British naval officer noted for, during Queen Anne's War, having led an abortive 1711 expedition against Quebec City, then the capital of New France. James Moore (c. 1650 – 1706) was the English governor of colonial Carolina between 1700 and 1703. He is best known for leading several invasions of Spanish Florida during Queen Anne's War, including attacks in 1704 and 1706 which wiped out most of the Spanish missions in Florida. He captured and brought back to Carolina as slaves thousands of Apalachee Indians. Jean-Baptiste Hertel de Rouville (26 October 1668 – 30 June 1722) was a colonial military officer of New France in the French Marines in Canada. He is best known in North America for leading the raid on Deerfield, in western Province of Massachusetts Bay, against English settlers on 29 February 1704. A dedicated soldier, he was widely reviled by the settlers of New England for his tactics of raiding poorly defended frontier settlements. During Queen Anne's War he also participated in military operations against the English in Newfoundland. He played a role in the early settlement of Île-Royale (present-day Cape Breton Island), after that war. Philippe de Rigaud, Marquis de Vaudreuil (French pronunciation: ​[filip də ʁigo maʁki də vodʁœj]; c. 1643 – October 10, 1725) was a French politician, who was Governor-General of New France (now Canada and US states of the Mississippi Valley) from 1703 to 1725, throughout Queen Anne's War and Father Rale's War. Pierre Maisonnat dit Baptiste (born in Bergerac, France 1663, died in Acadia after August 1714) was a French privateer famous for the success he had against New England merchant shipping and fishing interests during King William's War and Queen Anne's War. Baptiste's crew members were primarily Acadians. The Siege of Pensacola was two separate attempts in 1707 by English-supported Creek Indians to capture the town and fortress of Pensacola, one of two major settlements (the other was St. Augustine) in Spanish Florida. The attacks, part of Queen Anne's War (the North American theater of the War of the Spanish Succession), resulted in the burning of the town, and caused most of its Indian population to flee, although the fort withstood repeated attacks. The first siege, in August 1707, resulted in the destruction of the town, but Fort San Carlos de Austria successfully resisted the onslaught. In late November 1707, a second expedition arrived, and made unsuccessful attacks on three consecutive nights before withdrawing. Pensacola's governor, Don Sebastián de Moscoso, whose garrison was depleted by disease, recruited convicted criminals to assist in the fort's defense. The Siege of Port Royal (5 – 13 October 1710), also known as the Conquest of Acadia, was a military siege conducted by British regular and provincial forces under the command of Francis Nicholson against a French Acadian garrison and the Wabanaki Confederacy under the command of Daniel d'Auger de Subercase, at the Acadian capital, Port Royal. The successful British siege marked the beginning of permanent British control over the peninsular portion of Acadia, which they renamed Nova Scotia, and it was the first time the British took and held a French colonial possession. After the French surrender, the British occupied the fort in the capital with all the pomp and ceremony of having captured one of the great fortresses of Europe, and renamed it Annapolis Royal. The siege was the third British attempt during Queen Anne's War to capture the Acadian capital, and it had profound consequences over the next 50 years. The conquest was a key element in the framing of the North American issues in French-British treaty negotiations of 1711–1713. It resulted in the creation of a new colony—Nova Scotia—and introduced significant questions concerning the fate of both the Acadians and the Mi'kmaq who continued to occupy Acadia.The Conquest of Acadia was a foundational moment in the history of the Canadian state—it was a precursor to the British conquests of Louisbourg and Quebec in the middle of the century. The Siege of St. John's was a failed attempt by French forces led by Daniel d'Auger de Subercase to take the fort at St. John's, Newfoundland during the winter months of 1705, in Queen Anne's War. Leading a mixed force of regulars, militia, and Indians, Subercase burned much of the town and laid an ineffectual siege against the fort for five weeks between late January and early March 1705. Subercase lifted the siege after running out of provisions and gunpowder. The siege was part of a larger-scale expedition that was an attempt to repeat the highly destructive expedition led by Pierre Le Moyne d'Iberville in 1696. Many outlying English communities were destroyed by Subercase's men, leading to reprisal raids by the English. Fishing activities on both sides suffered for the duration of the war, which ended with the French cession of its claims to Newfoundland. Simon-Pierre Denys de Bonaventure (22 June 1659 – 7 February 1711) was an officer in the colonial troupes de la marine of New France and was heavily involved with the events of Acadia from 1685 until his death. He participated in the Naval battle off St. John (1691), the Naval battle off St. John (1696) and the Siege of Pemaquid (1696). He governed Acadia after the death of the governor Jacques-François de Monbeton de Brouillan (September 1705) until the appointment of the new governor, Daniel d'Auger de Subercase on 22 May 1706. The Treaty of Portsmouth, signed on July 13, 1713, ended hostilities between Eastern Abenakis with the British provinces of Massachusetts Bay and New Hampshire. The agreement renewed a treaty of 1693 the natives had made with Governor Sir William Phips, two in a series of attempts to establish peace between the Wabanaki Confederacy and colonists after Queen Anne's War.